Online Video Best Practice: How Long Should Your Videos Be? By now, you’re convinced of the power of video marketing (or you should be!). You know that almost all businesses see video as an effective tool for increasing sales and reducing support costs. You also know that the vast majority of consumers prefer to watch video about a product they’re considering rather than read about it, and that many of them go on to make the purchase. However, you’re also aware that it’s easy to get things wrong with video, and sometimes to have the unintended consequence of annoying your audience. We’ve all seen examples of companies that have been burned by using a voiceover that was too formal, or including a tagline that they never imagined would be offensive to some viewers. You may have wondered why some big budget celebrity stunt video ads go viral, while others leave audiences confused about their message. And of course, you know the importance of including a call to action so that viewers know exactly what you’d like them to do next. However, one of the most perplexing questions that you might be asking around video best practice is: “how long should our video be?” After all, according to Microsoft, human attention spans in the digital age are now only eight seconds, which is a whole second less than a goldfish! Buzzsumo took a look at Facebook and found that shorter videos generate more interactions on average, with the sweet spot being between 60 and 90 seconds. Interestingly, they also found that the very shortest videos – those under 30 seconds – generated the lowest overall engagement. However, over on Facebook’s sister platform Instagram, Hubspot discovered that the most commented videos averaged 26 seconds. Hubspot attribute this difference to the speed at which our brains process the visual material on which Instagram is based, meaning that we scroll faster on Instagram than on any other app! If your video is a clearly promotional ad (rather than an explainer or native content storytelling), then shorter really does seem to be better. COO of Facebook, Sheryl Sandberg, said in 2017 that compared to 15 or 30-second ads, 6-second spots showed higher brand metrics "across the board”. YouTube is a special case because it’s dedicated to video, so watching video content is the reason people are there – you don’t have to distract them from their newsfeeds and catching up with friends. But the content still has to be compelling and fast-moving – the most engaged with YouTube videos are about two minutes long. Don’t forget live video, which changes the equation again. Facebook, one of the biggest platforms for live video, says that its users spend three times as long watching live video as they do recorded material. Buzzsumo’s analysis found that for live video, viewer interactions increase the longer the video lasts, up till about 18-20 minutes, after which point they remain fairly stable. 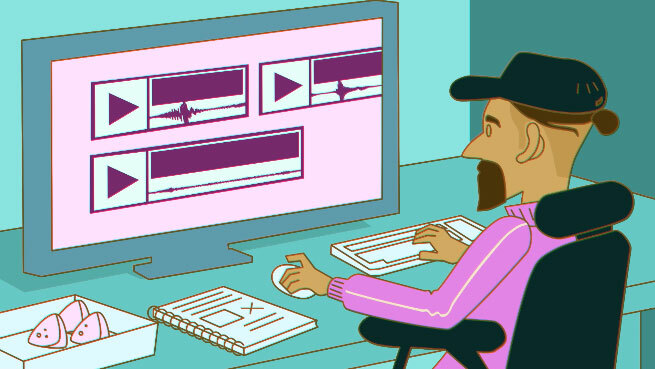 If it seems as if asking how long your video should be is like asking “how long is a piece of string?” our new online video course should give you some ideas. It’s got plenty of ideas and best practices for creating videos that will get your audience’s attention, engagement and response – hopefully for more than eight seconds! To get a good idea of the content of our new lesson, go to the Online Video course page or check out a clip from the lesson below.